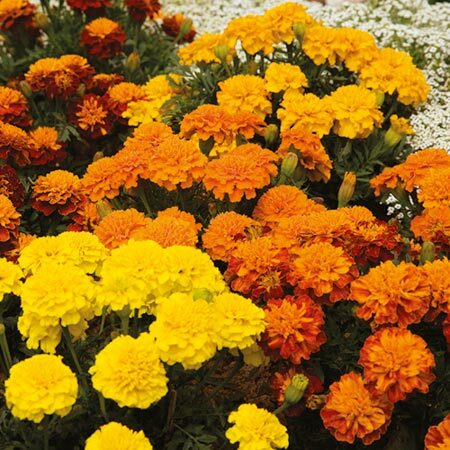 Simply the best dwarf, fully double marigold. This really is an appropriate name for such a stunning variety. Large double heads over 5cm (2”) in diameter. Impressive grown as an edging or in drifts. Height 13cm (5”); spread 15-20cm (6-8"). HHA - Half-hardy annual. Sow February-May, flowers June-September. Suggested planting distance 23cm (9"). Easily grown from an indoor sowing they can be sown direct outside for later flowering. Real sun lovers to light up your garden. Ideal for beds and borders, patio pots and containers. Drought tolerant. Prefers full sun. Need a sunny position and will flower throughout the summer.